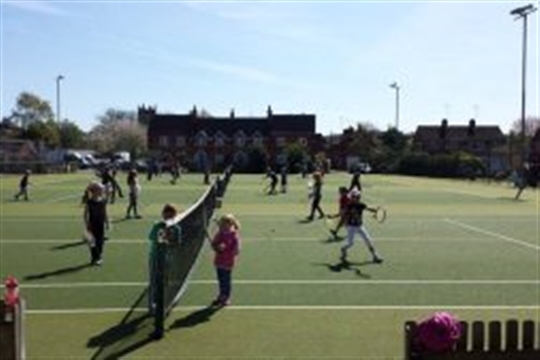 Alcester Tennis Club is a vibrant club situated in the heart of the town. Although we’re not the biggest club in the world, we are extremely friendly and have BIG aspirations which are exceeded time after time! In partnership with Inspire2Coach we offer top class coaching for all ages in both group and individual settings. We were the first club in Warwickshire to put down the revolutionary Tiger Turf surface which offers a very true bounce while being kind on the joints! A standard week at the club will see group coaching for all age-groups and at all levels, organised social play and less traditional more contemporary activities such as Cardio Tennis. Or you could simply book a court, come down and play! Sessions including Cardio Tennis are open to members and non-members alike and your first session is free, so you can try before you buy! Please come down to the club and talk to any of the coaches or members to ask any questions you may have. Alcester Tennis Club is affiliated to the LTA, which means that we pay a fee each year based on the size of the club. For this we receive advice on coaching, membership, courts, running tournaments etc., as well as access to grants to improve our facilities, such as the new floodlights for the kids zone. A few years ago the LTA replaced their individual membership scheme with British Tennis Membership (BTM) for individuals, see http://www.lta.org.uk/BritishTennisMembership/ , and encourages everyone who plays tennis to join, and likewise Alcester Tennis Club encourages all its members to sign up to BTM. Our Wimbledon ticket allocation depends on the number of BTM members we have.